The New Jersey Turnpike comprises a 122-mile long toll road linking the Delaware Memorial Bridge (Interstate 295 & U.S. 40) with the New York metropolitan area. 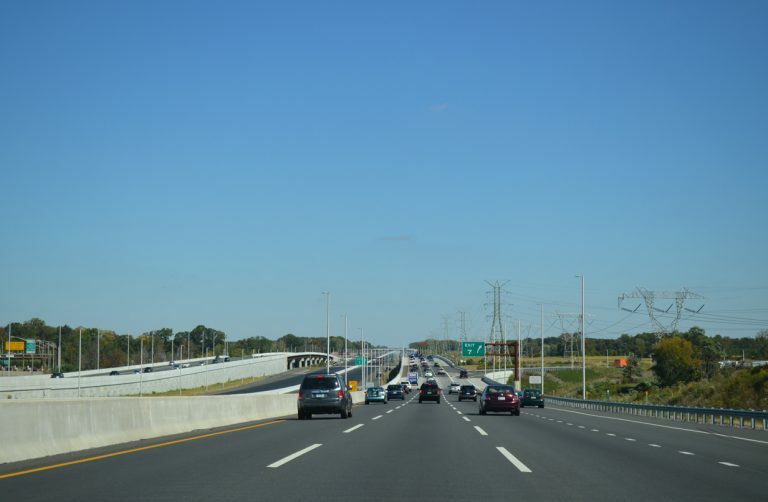 The toll road provides a major link between Washington, Baltimore, Philadelphia and New York City. The four to sixteen-lane highway was built in a typical turnpike design with high speed lanes and limited interchanges. Turnpike travelers also are provided with service plazas to provide on-site gas, food, and tourist information. Interstate 95 follows the turnpike from Interstate 195 (Exit 7A) northward to the end at Interstate 80 and the George Washington Bridge approach. From Exit 6 (Pearl Harbor Memorial Turnpike Extension) northward, the turnpike divides with four roadways: Two inner roadways restricted to cars only and two outer roadways open to cars, trucks and buses. Northbound view of the New Jersey Turnpike at Exit 7, taken just a couple of weeks before the new Inner Roadway opened to traffic. Photo taken October 5, 2014. Two extensions are apart of the New Jersey Turnpike network. The Pearl Harbor Memorial Turnpike Extension provides a direct link between the north-south toll road (Exit 6) and the Pennsylvania Turnpike mainline (Interstate 276) at Bristol, Pennsylvania. This east-west roadway doubles as future Interstate 95, awaiting completion of the PA Turnpike and I-95 interchange at Bristol slated for late 2018. The New Jersey Turnpike Extension comprises Interstate 78 from Exit 14 east to Jersey City and Hoboken, providing direct access between the Turnpike (Interstate 95) and the Holland Tunnel into Manhattan. Since Interstate 95 follows the New Jersey Turnpike from Exit 7A northward to Interstate 80, and future Interstate 95 follows the Pearl Harbor Memorial Turnpike Extension and the north-south road from Exit 6 to Interstate 195, the guides for the New Jersey Turnpike double as the guides for I-95. The Vince Lombardi Service Area resides ahead of the apex between the New Jersey Turnpike branch separation in Ridgefield. The position of the area allows the plaza to service all directions of the split turnpike. This set of signs directs motorists exiting the facility between the truck area and park and ride lot. Photo taken 08/29/05. "Rain delays opening of new NJ Turnpike lanes." NJ.com, October 24, 2014. "New southbound Turnpike lanes open." NJ.com, November 3, 2014.